When visiting Battle Harbour at the entrance to the St. Lewis Inlet in Southern Labrador, you will find unique accommodations, a world of history as well as a General Store that carries some necessities needed while on the island. A stack of wood leaning against each other sits outside the General Store while the yellow glow illuminates the store windows as the fog settles in around the island. General Store and a stack of logs on a foggy evening in the historic fishing village of Battle Harbour situated on Battle Island at the entrance to the St Lewis Inlet, Viking Trail, Trails to the Vikings, Southern Labrador, Labrador, Atlantic Canada, Canada. 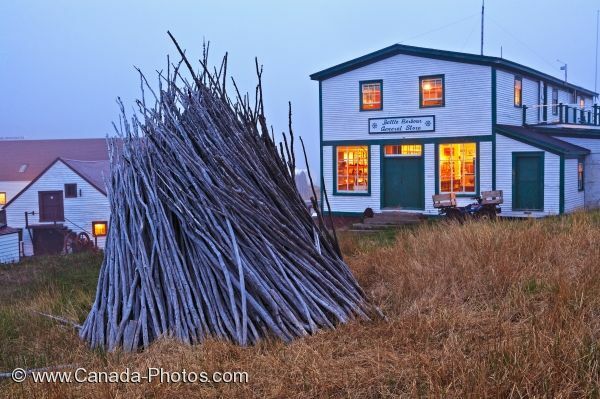 Picture of a stack of logs and the General Store in Battle Harbour on Battle Island in Southern Labrador, Canada.